Every month, follow Little Passports characters Sam and Sofia as they embark on a new country adventure. Your first month’s Explorer Kit arrives in a suitcase and contains everything your child needs to get started learning about our big world: a letter from Sam and Sofia, a map, a passport, stickers, access to online games and more. Country specific packages filled with fun souvenirs, letters, stickers, photos and activity sheets arrive every month thereafter. 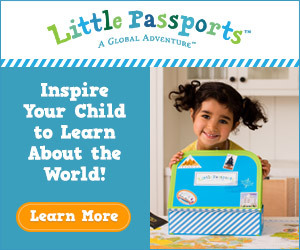 Get started with Little Passports today, subscriptions start as low as $10.95! Little Passports is partnering with Luxury Link to give away a trip to Belize, worth $5,000, to one very lucky family. It's easy to enter, and they’re offering bonus entries for participating in fun games, trivia questions, and more. Take 1 minute to enter this giveaway, and maybe YOUR family will win the trip of a lifetime! Win a trip to Belize from Little Passports!